As an avid sports fan, I love to attend sporting events. A few years ago, I attended my first marathon up in Duluth, MN (Grandma’s marathon). At that marathon, I learned two important lessons. One, I never want to run a marathon - try watching people cross the finish line crying, hobbling, carrying or supporting each other, limping, hobbling, and sobbing. Just wasn’t a good motivator, although I did cheer them on mightily for finishing! Second, I learned that all kinds of people can finish marathons. I assumed I would see all skinny, thin-legged, boney marathon runners, but was pleasantly surprised to see all heights, weights, and body types crossing the line. Unfortunately, dogs are not the same way. Next week, I’ll talk about pet dangers of running with your four-legged friend. In the meantime, find out if your breed of dog is even meant to run! I’m always happy to see all different types of dogs running along the Mississippi, but it’s true that some dogs were just not bred to run. These breeds include Boston Terriers, Pekingese dogs, Pugs, French Bulldogs, and English Bulldogs. Likewise, if you have a really lazy dog and can’t lift a 100 lb. dog into your car, it’s probably best not to go more than a mile; this is especially true if you have a big dog such as a Doggie de Bordeaux, Mastiff, or Newfoundland. Next, look at the muscling of the dog. If your dog is excessively muscled, he probably prefers to sprint. These types of dogs (like Greyhounds, Pit bulls, and Boxers) have such dense muscle mass that they can overheat easily. In general, if your dog’s legs are shorter than his body height, he’s probably not a great runner. Finally, if your dog has a smooshed face, small nostrils, pants a lot even at rest, or snores louder than your husband, he’s also probably not a natural born runner – he’d be okay to run or jog short distances only. Otherwise, check with your vet, or take it very, very slow when acclimating your dog to your torturous hobbies. My pit bull likes to run for the first 2 miles. He can stay with me for 6 miles, but then he starts lagging behind about 20 feet. While I’m running with him, I can only imagine people walking or driving by thinking, “Geez, that’s animal cruelty. That poor dog looks exhausted!” The truth is my dog could probably run miles without any problem, but it doesn’t mean he’d enjoy it. Use your discretion when running with a dog – I can’t go more than 3 miles with my dog without feeling like I’m torturing him. Some hyper Labradors will run 10 miles longer than they should, and risk orthopedic injury, soreness, or heat stroke in the process. In the same way, when your dog is 10, think about whether or not you would make your 70-year old grandfather run 10 miles with you. Look for a dog that is excitable, likes to run and play, and is in good condition. Classically, Labrador Retrievers love to run and play, and they make good running partners, as do Golden Retrievers, German Shorthaired Pointers, Border collies, mutts, Schnauzers, to little Shih Tzus. 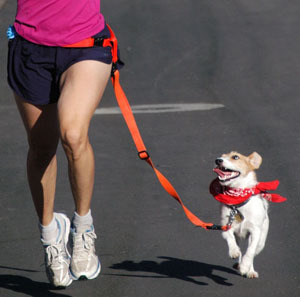 Slowly acclimate your dog to running – don’t just expect him to cover 5 miles on day one and 12 miles by day 2. If your dog is panting excessively, dragging behind, or looking tired (even on a cool day), take it easy. It’s not worth hurting your pooch just to train for your marathon! Material from It’s a Dog’s Life… but It’s Your Carpet. More information available at www.drjustinelee.com.